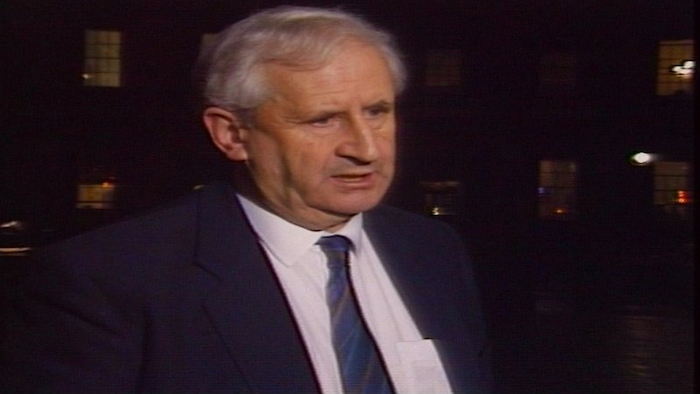 Fianna Fáil Leader, Micheál Martin TD has said that Ireland has lost one of its greatest public servants with the passing of former TD and Minister, Seán Calleary. “Seán served his county of Mayo as a TD for 19 years, and served as a Government Minister for eight years. “He served with distinction and honour in the 1980s and early 1990s as Minister of State in the Departments of Labour and Public Service, Industry and Commerce and then Foreign Affairs. “A fine sportsman and sports administrator, Seán played junior football with Mayo, and also donned the colours of Galwegians and Connacht albeit under an assumed name because of the GAA ban. “Following his playing career he performed leadership roles in both Mayo CLG as selector and Connacht rugby as President of the Connacht branch of the IRFU. He was particularly pleased to be inducted into the Mayo Sports Star Hall of Fame in 2014. “Seán was proud of all of his children’s achievements, and of course, he took great pride in his son, Dara, being elected to serve the people of Mayo in Dáil Éireann in 2007 and at every subsequent election. “During his life, Seán made an enormous contribution to his county, his region and his country. He will be greatly missed. “My thoughts and sympathies, and those of the entire Fianna Fáil organisation go out to his wife, Doris, his sons Conal, John and Dara and his daughter Síofra at this sad time. Former Taoiseach and constituency colleague Enda Kenny TD paid tribute to Calleary saying. “I sincerely regret the passing of former Fianna Fáil councillor, TD and Minister of State, Seán Calleary. “I served with Seán for many years on Mayo County Council and as a deputy in Leinster House. Seán was a fearless defender of Ballina and Mayo. “As a young deputy, Seán Calleary often gave me advice on particular political difficulties that arose from time to time. “As a rugby player, Seán understood what team effort was like and brought that to fruition with his native Ballina. He was also an avid supporter of Mayo senior footballers over the years. Ballina has lost one of its finest sons. Chairperson of the Fianna Fáil Mayo Comhairle Dáil Ceantair, Gerry McGuinness said: "It is with great sadness we hear of the death of one of our Party Presidents in Mayo Fianna Fáil, former Junior Minister Sean Calleary. "Sean served his area with both passion and conviction over many years as a county councillor, TD and Junior Minister. His love for Mayo, particularly his native north Mayo, shone through his politics and his non-political pursuits, especially his passion for sports. "His quiet demeanour on and off the political field belied a sharp and curious brain which retained facts and brought them back at will whatever the discussion and made Sean a pleasure to chat to on any topic. He was always to be found deep in conversation, giving his viewpoint on the issues of the day. "It’s fitting to remember Sean for what he was, a gentleman, as he was considered across the political divide to be, willing to talk to anyone on an issue and show the greatest respect to all, even those he disagreed with. His continued contribution to the Fianna Fáil party in the constituency after his retirement was invaluable and was rewarded when he saw his son Dara elected to represent Mayo in Dail Eireann. "Ballina, North Mayo and the entire county has lost a dedicated servant and Mayo Fianna Fáil expresses its deepest sympathy to his wife Doris, children Siofra, Dara, Conall and John, his extended family and all his many friends"